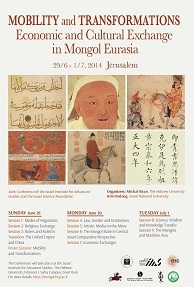 Home > News & activity > International conference begins on Sunday, June 29, 2014! International conference begins on Sunday, June 29, 2014! 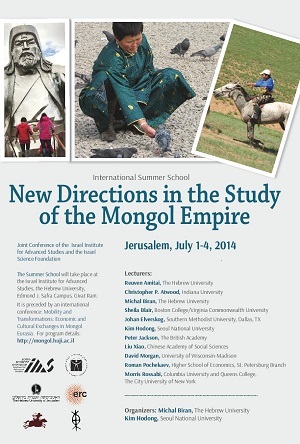 The international conference "Mobility and Transformations: Economic and Cultural Exchange in Mongol Eurasia", the first part of the joint research conference of the Institute for Advanced Studies of the HU and the Israel Science Foundation "Mobility and Transformations: New Directions in the Study of the Mongol Empire" starts on Sunday, June 29, 2014 at 10:00. All lectures will take place at the Center for the Study of Rationality, Feldman Building, Eilat Hall, The Edmond J. Safra Campus of The Hebrew University, Givat Ram. More about the program of the conference and other details can be found on the page of the conference on the website of our project. The information on the international summer school which will follow the conference can be found on the page of the ISS.